Have you ever booked party entertainment for a child’s birthday party? If so, what have you booked? Here are some fun & unique party entertainment ideas for kids that may be perfect for your next birthday party. All of these ideas are for in-home parties. Some may not be available in your city and some others you may have to be a bit creative with. For example, if you want some carnival games at a circus-themed party but no one in your city rents them, you may have to create your own fun games for the kids along with stuffed animal prizes! Hire a costumed entertainer like a clown, princess, superhero or a cowboy. Many of these entertainers come prepared with fun games for the kids to enjoy. A magician can amaze your little party guests by teaching them a small trick to take home and show their own families. Animal guests are always a hit for a child’s birthday party. Check your local listings for a petting zoo, reptile farm or local zoo that has small animals that can accompany a trainer to the birthday party. Does your little one want an arcade party but there isn’t one in your area? Here are some fun ways you can create your own arcade party at home. Hire someone with a silly & special talent like making balloon animals or face painting. Want a completely unique favor to send home with your guests? Hire a caricature artist to draw pictures of each of the children at the party. Hire a scientist to do some fun science experiments with the kids. If you don’t have an entertainer like that in your city, you can try a few of these kid-friendly ideas from Science Bob. Do you have a little diva who would love a party at the spa? Check your local listings for a mobile spa service that will come to your home to do mini manicures and pedicures for the guests. What’s better than a bounce house at a birthday party? A bounce house with a wrestling trainer that can teach the kids some safe wrestling moves inside the bounce house! Contact your local art studios for mobile birthday party packages. Many have party entertainment ideas for kids that they can bring right to your home (like painting on canvas, painting pottery pieces, etc.). Don’t feel like doing to cooking for the birthday party? With all the preparation that goes into the party, I don’t blame you! How about hiring a food truck (like a burger & fry station) to drive to your house and serve the party guests in your front yard and garage area. This same idea could be used for an ice cream truck. If your little one loves dancing, try contacting some local dance teachers to see if they’d be willing to attend the party to do a private dance lesson for your little guests. For the bakers and mini chefs, contact local bakeries or chefs (perhaps a friend of a friend?) to attend the party to do a short lesson with the kids. They could all bake & decorate their own cupcakes or mini birthday cakes! Hire a high school sports coach to do a mini training camp with the kids. Did you know that many bounce house rentals also offer inflatable screens you can rent to watch a movie in your own backyard? If you have (or can rent) a projection machine of course. Planning your own treasure hunt or scavenger hunt is always on the top of the list for party entertainment ideas for kids. A backyard garden tea party would be perfect for a ladybug party theme. You could set up your own photo booth at home with some silly props and take pictures of the kids. Planning a dinosaur theme? Some museums offer mobile exhibits that they could bring out to you. Having a circus theme but don’t have the room for a circus tent and elephants? No problem! 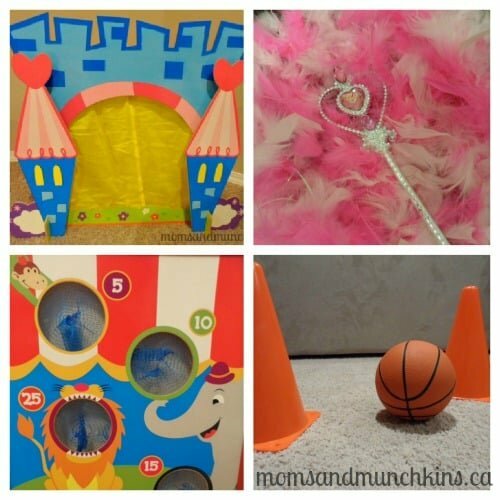 Here are some fun ideas for creating your own carnival games at home. For the younger crowd, hiring a musician to do sing alongs with the kids would be a fun idea. How many kids do you know that have been in a limo? A fun idea would be to surprise the kids with a limo to pick them up and take them on a tour of the city. Most little kids love dance parties. A fun idea would be to hire a DJ for an at-home dance party. Many DJ’s would have fun party entertainment ideas for kids since they attend a lot of parties. Something that may be more fun for the older crowd is to hire a fortune teller. For the younger crowd, a fun entertainment idea could be a puppet show. Perhaps the kids could create their own puppets and then put on a play for each other. I’ve never seen one in person but a ventriloquist is certainly on the list for unique party entertainment ideas for kids. Did you know that many party entertainment companies offer entertainers that do stunts like fire-eating? A fun & unique idea would be to hire traditional dancers to perform at the party. Your local culture clubs may have dancers in training that would love the additional practice and exposure. For a Hawaiian themed party, a hula dancer would be a fun addition. You can find grass skirts and leis at your local dollar store. Henna or an airbrush tattoo would be a unique idea that the guests would enjoy. What type of unique party entertainer would you like to hire for a party? Do you have any unique party entertainment ideas for kids? What party entertainment ideas for kids have you seen parents use at parties? We’re always adding new creative ideas for parties. Never miss an update by following along on Facebook, Twitter, Pinterest and Bloglovin’. I always struggle with my kids parties, what to do? Thank you for these suggestions! I think a scientist would be awesome! And I know my niece would love to have a dance instructor come to her party. What great ideas!! I recently had a princess party for my little girl and she LOVED it!! Planning my boys’ parties is kind of tough!! I never know what the kids will enjoy and what not….thanks for your tips! These ideas are great! I have 2 birthday parties to plan in the next 3 months and I have no idea what to do…this really helped!